Currently applied process automation solutions rely on predefined control recipes with preprogrammed material transfer routes in the subjacent control software. Thus, the flexibility is limited with regard to dynamic environment conditions such as a change of production job priorities or a modification of the system layout. In this context, agent technology is seen as a promising approach for providing such flexibility. 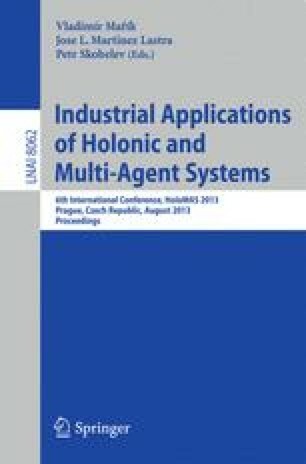 This paper presents a multi-agent system for batch process automation, which introduces the concept of phase agents for controlling the physical equipment. The phase agents incorporate control software based on the standard IEC 61131 for PLC programming in consideration of compliance to the standard IEC 61512 Batch Control. In the context of material transfers, a route finding algorithm is introduced for dynamically calculating suitable routes. Moreover, demonstration applications are presented to show the feasibility of the approach.